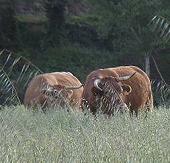 Accommodation in Exquisite SouthWest Portugal, West Algarve. 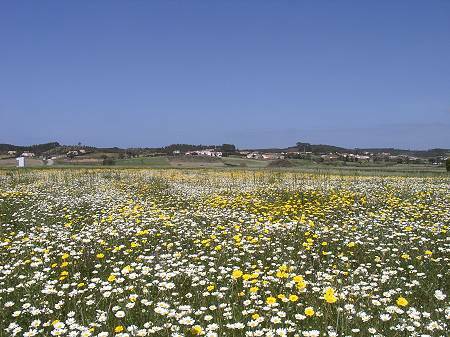 Alfambras is a farming settlement in the Costa Vicentina Natural Park amidst rolling green hills and farmland. This protected conservation Park spreads along the entire Western coast of the Algarve, covering nearly 80 km of coastline. It offers a huge variety of plants, animals and birds in their natural habitat. You will see herons and storks soaring the skies and hear nightingales singing in the quiet nights. The early summer is the time of the flowers. A walk through the nature is a walk through natural gardens. An incredible variety of native flowers cover the fields and wild cliffs along the sea. The nearest beach (4 km) is Vale da Figueira, an uncrowded wide sandy beach where you can take long walks, swim, surf and fish. Just 12 km to the South is the famous surf town and beach of Carrapateira, with its long beach amidst huge dunes and an inland lagoon frequented by herons and water hens. 11 km North of Alfambras is the village of Aljezur. We have many places to stay in Alfambras. It is a very quiet and beautiful place to spend your holidays. It is well situated with access to great beaches and a short drive to Aljezur and to the Lagos and the south coast.